Husqvarna is one of the most famous lawn mower companies in the world. They make zero turn mowers, cordless mowers, and Husqvarna robotic lawn mowers. By reading our reviews, you might even be inclined to think that they are the best manufacturing company when it comes to lawn care, and you might be right! They are truly built with excellent care and attention to detail making them some of the most elegant and functional products on the market. The Automower 450X mower is one of the greatest creations of Husqvarna. This model just takes everything to the next level. Battery life, speed, artificial intelligence adaption, and more. 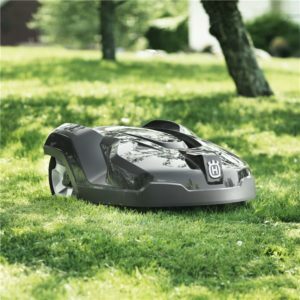 Almost all customers of the Husqvarna Automower robotic lawn mower are extremely satisfied with their purchase which just goes to show you the extent that this company is willing to go to. It really is one of the most reliable robotic mowers you can find this year and it’s certainly in the running of being the best. Across the board, most people agree that this model by Husqvarna is one of the best robotic lawn mowers. Considering the fact that these products are still in their infancy, it is often difficult to tell which product is better than the other. This one stands above the crowd when you weigh in its effectiveness, price, and durability. As we get busier and lawn care services get more and more expensive, purchasing a robotic lawn mower by Husqvarna makes more and more sense. This model can mow up to 3/4 of an acre in one session which is truly a remarkable feat. This is a Husqvarna robotic mower that is less smart than its predecessors, but it remains smart nonetheless. In general, it does most things with the same level of competence as the 450X. However, this robotic mower is a bit of a hassle to install. With all robotic lawn mowers, you must install a set of “invisible walls” that the unit is restricted from passing. Because your lawn does not have walls like the inside of your home, this product must be installed in a different way when compared to a Roomba which essentially serves its purpose in the same way. This 967623405 model is still a fantastic choice and like with other Husqvarna products, you probably won’t be disappointed. The AM310 model we have here is great. The pricing is actually even more fair than with other products by Husqvarna. However, because of the lower cost, you’re giving up some things you would otherwise not do with a 450X. For example, the battery life is not as great and you do not get some of the exclusive features such as mobile app connectivity. Despite all that, for the average customer with a relatively small lawn, this would make for a fantastic purchase. It’s lightweight, mobile, decently powerful, and gets the job done. You will save either time or money with the AM310 and we all know how valuable both of those assets are. Last but certainly not least, we have another AM315 robotic mower. Though it is intended for smaller projects, it can still do a ton of work and it can do it effectively. They can work on 1/3 of an acre per charge while other mowers such as the 450X and 430X can do far, far more. Does this make the AM315 mower obsolete? Absolutely not. The fact of the matter is that most people do not need so much power in a robotic lawn mower and are willing to give up some of it for a substantially lower cost. If you have a smaller lawn and don’t care much about the luxury features, this can make for a great purchase. Should you buy Husqvarna robotic mowers? Not everyone needs to buy a robotic mower. Some people will be better off purchasing a zero turn mower while others need a cordless mower. Some may even have such small gardening projects that they opt for string trimmers. These products are suited for busy people with lawns that are less than an acre in size. Most people are busy and do have lawns and backyards that are much smaller than an acre, so these units can be purchased by most people. If you’re an individual who has a lawn/garden that is filled with jagged edges, hills and bumps, and lots of places for the device to get stuck on, it may not be for you. Most of these robotic mowers are able to tolerate a certain level of rocky terrain, but no robotic mower is able to take on ridiculously uneven and complex terrain. For people with relatively flat and open spaces, these robotic lawn mowers by Husqvarna are excellent additions. Thankfully, there are not so many Husqvarna robotic lawn mowers and because of the minimized list to choose from, the decision can become much easier. So which one(s) do you go with? Really, it comes down to features, amenities, and the size of the lawn that you need required. For typical lawns in residential areas, every single mower can and will get the job done efficiently and successfully. When it comes to large and/or commercial areas, things get tricky. You may need multiple units if you’re in need of multiple acres of land to be mowed. If you’re in such a situation that the lawn is so big, some zero turn mowers like the Poulan Pro and Husqvarna MZ61 are better choices. They are obviously not automated and must be manned by a person, but in the long run you’ll save time and money. Read our reviews to find out which mowers will suit your situation better. Clearly, there are a ton of ways you can go about mowing your lawn. You can use a cordless or zero turn mower, you can pay someone to mow using the product of their choice, or you can even purchase a robotic lawn mower or an ATV mower. If you do decide to go this route, we highly recommend going with Husqvarna. Continuously, they prove that they are the firm to go with when it comes to lawn care, gardening, and lawn mowers. These robotic lawn mowers may seem like gimmicks at first, but they are totally practical and worth the money in the long run.